Mayor Boris Johnson today backed an extraordinary attempt by London councils to grab power for the people. A new City Charter would give them the right to choose local police commanders and have a crucial say on health and transport policies. Uh-oh. The plans include letting councils appoint their own police chiefs, control bus routes and take back Transport for London’s power over major roads. Basically, this looks like an attempt to whittle away at the powers of the mayor and London assembly, giving a future government an excuse to abolish it. This is madness – London boroughs are hardly the most democratic of organisations, elected on low turnouts (Greenwich managed 35.81% in 2006) under a first-past-the-post system, while the London mayoral and assembly elections last year had a turn-out of 45% on proportional representation, which has meant a wide range of views are represented there and no vote is wasted. Some councils are basically one-party states, where opposition finds it hard to get off the ground, while Greater London is finely balanced between the left and right, meaning power has swung fairly evenly between Labour and the Conservatives since the boundaries were established in the mid-1960s. And London’s often-arbitary borough boundaries cut through communities and create administrative difficulties for even the most simplest of things. An example – at the end of Crystal Palace Parade, four boroughs meet. Walk from the bus stops, around the mini-roundabout, and into the park, and you’ll go from Southwark, to Lambeth, to Croydon, and to Bromley. Walk to the rear of the park and you’ll end up in Lewisham. When Bromley Council wanted to redevelop the site of the old Crystal Palace, there was outrage from its neighbours. Lambeth Council has a set of recycling bins at the end of Crystal Palace Parade. Twenty steps away, there’s a Southwark “recycling centre”. A mayor should be there to smooth over those differences, not encourage them under some misleading claim of “democracy”. A further example – the recent closure of the A2 at Blackheath Hill, west Greenwich. 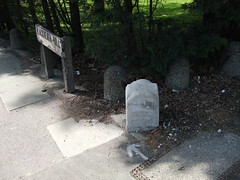 A boundary quirk means this stretch of road is in the borough of Lewisham – there’s the boundary stone on the right, next to a (Greenwich) sign. Greenwich’s light green wheelie bins face the dark green of Lewisham on opposite sides of the road. However, it is maintained by Transport for London, so the divide doesn’t really matter so much. But left to their own devices, Lewisham and Greenwich don’t have the best of records on co-operation. In the early 1990s, they had a big falling-out about Greenwich imposing a lorry ban in Greenwich town centre, forcing HGVs onto Lewisham’s A2. While the A2 was closed, Lewisham refused to allow buses use some of its roads as a diversion route, sending the problem to Greenwich. Likewise, Greenwich recently declined to involve neighbouring Lewisham residents in consultation about the Olympic Games in Greenwich. Left to their own devices, could you really trust these organisations to work together? The most hare-brained idea is allowing councils control of bus services – even though very few routes stay wholly in one borough. What is there to stop, say, Greenwich from re-routing services away from Lewisham to give its own shopping centres a boost? Most of our lives aren’t spent just in one borough. I live in Greenwich, used to work in Hammersmith & Fulham, do some of my shopping in Lewisham and Tower Hamlets, and visit family in Bexley. If anything, boroughs need less power so they can concentrate on nitty-gritty issues like local housing, cleaning streets, and running leisure facilities; and leave the big-ticket stuff to London-wide authorities. Or if they must have more power, then they need to be reformed with redrawn boundaries, properly elected, not on outdated first-past-the-post elections which see them elected by tiny minorities. If you’re fan of Boris and you’re not convinced – imagine having the current Greenwich Council run everything for the next few years, without the mayor you backed last year to keep them in check. There, not such a good idea now, is it? That is a scary prospect, indeed, for those of us who live in Haringey. Anything to save money, or to hand power to someone else, that our Boris. Some days I fear his ultimate goal is to shut down City Hall and reopen it as a hotel and shopping arcade. Found this via Tory Troll’s links. I saw the Evening Standard billboards a few days going on about how Boris wanted a revolution or somesuch. Glad you’ve exposed how undemocratic it would be to hand power back to the councils. I see you’re a fellow GP member: by all means, please get involved at a London level when we plan the next Mayoral/GLA campaign, as we need people who’ve been keeping a watchful eye over Boris’s idiocies to help us craft the right message. What’s worrying is that most of what Boris has done (or rather, hasn’t done) doesn’t seem to bother most Londoners in the slightest, meaning that unless we inform them about how awful a Mayor he has been he will definitely get re-elected! Some interesting points there Darryl. I’d agree that opinion in Greenwich would be better represented if the Council comprised say, 10 five-member wards elected by PR. But you don’t say exactly what “big-ticket” responsibilities the Councils might lose to City Hall. It would indeed be daft if each Borough ran its own bus service, but residents might get a better response if things like traffic light phasing and pavement repairs on red routes were dealt with locally rather than by TfL. Rayyan – ta for the kind words.